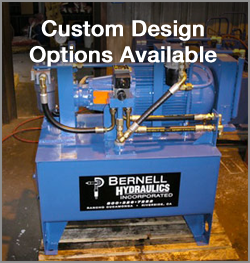 Bernell Hydraulics doesn’t just sell parts–we work on hydraulic systems too so we actually understand the parts we sell. In the course of our 40+ years in business, we’ve developed an expert team of hydraulics parts and service professionals. We’re happy to help you troubleshoot hydraulic cylinder problems and recommend solutions. For instance, if your cylinder seals are failing really frequently, the culprit could be the seals or the rod finish on the cylinder. We’ll help you figure out which part is to blame so you can address the problem and enjoy longer hydraulic cylinder life in the future. If you have old or rare equipment, you might not be able to get the parts you need ready made. Luckily, we can machine custom parts for you. Just tell us your specs and our expert technicians will set about machining your custom hydraulic cylinders San Bernardino CA in our shop. We can even install them in your equipment at your job site if needed.